Will the real James Bond please stand up? Sir Fitzroy Hew Royle Maclean, 1st Baronet, KT, CBE (1911 – 1996) was a Scottish soldier, writer and politician and was one of only two men who during the Second World War enlisted in the British Army as a Private and rose to the rank of Brigadier, the other being Conservative MP Enoch Powell. Maclean wrote several books, including Eastern Approaches, in which he recounted three extraordinary series of adventures: travelling, often incognito, in Soviet Central Asia; fighting in the Western Desert Campaign, where he specialised in commando raids behind enemy lines; and living rough with Tito and his Yugoslav Partisans. It has been widely speculated that Ian Fleming (his friend), used Maclean as his inspirations for James Bond. Maclean was born in Cairo to Major Charles Wilberforce Maclean QOCH a member of the Scottish landed gentry serving in Egypt with the Queen’s Own Cameron Highlanders, and Frances Elaine Gladys Royle the only daughter of George Royle, a Royal Navy officer, and Fannie Jane Langueville. He was descended from the Macleans of Ardgour, a Sept of the Clan Maclean, whose chiefs have their historic seat Duart Castle on the Isle of Mull just over the water. He also studied in Germany before joining the Diplomatic Service in 1933. A year later Fitzroy was posted to the British Embassy in Paris. Bored with the undemanding routine, he requested a posting to Moscow. The two and a half years he spent in the Soviet Union formed the first third of his best known book, the autobiographical Eastern Approaches. He was in Moscow until late 1939, and was present during the Stalinist purges. Although he was stationed in the capital, Maclean travelled extensively, by train, into remote regions of the USSR which were off limits to foreigners, was shadowed by the NKVD (the naughty brigade). When war broke out in 1939 he was prevented from joining the military because of his position as a Diplomat. He was 2nd Secretary in the Foreign Office. He resigned from the Diplomatic Service – immediately took a taxi to the nearest recruiting office and enlisted as a Private in the Queen’s Own Cameron Highlanders. He was soon promoted to lance corporal and was commissioned in 1941. In North Africa 1942, he distinguished himself in the newly formed Special Air Service (SAS), where, with Ralph A. Bagnold, he developed ways of driving vehicles over the Libyan sand “seas”. He was a brilliant practitioner in the T. E. Lawrence brand of fighting, reporting directly to Winston Churchill in Cairo. A letter of introduction from David Stirling said of him: “He has done well on our raids. Don’t be taken in by his rather pompous manner or slow way of speaking – he is OK.” Later that year he transferred to the Middle East as part of the Persia and Iraq Command. He was “allotted a platoon of Seaforth Highlanders and instructed to kidnap” General Fazlollah Zahedi, the commander of the Persian forces in the Isfahan area. Maclean captured him and smuggled him out by plane to Palestine. This incident soon led Hitler’s government to withdraw support from its network in Persia. Churchill chose him to lead a liaison mission (Macmis) to central Yugoslavia in 1943. Josip Broz Tito and his Partisans were emerging as a major obstacle to German control of the Balkans. Maclean got to know Tito well. As Churchill personally told him, your (Maclean) mission is not to concern yourself with how Yugoslavia was to be run after the war, “simply to find out who was killing the most Germans and suggest means by which we could help them to kill more”. Having been appointed a Commander of the Order of the British Empire (CBE) in 1944, he received the Order of Kutuzov (Soviet Union, which impressed the Soviet troops in Belgrade), and after the war the Croix de Guerre (France), and Order of the Partisan Star (Yugoslavia). He reached the rank of Brigadier during the war, and was promoted to Major General in 1947. He married Veronica Nell Fraser-Phipps a Roman Catholic in 1946. She was the daughter of the 16th Lord Lovat and widow of naval hero Lt. Alan Phipps, who was killed ashore at Leros in 1943. Sir Fitzroy was honoured with the baronetcy of Maclean of Strachur and Glensluain in 1957, was made the 15th Hereditary Keeper and Captain of Dunconnel Castle in 1981 and was made a knight of the Most Ancient and Most Noble Order of the Thistle in 1994. Dun Chonnuill Castle, Argyll, is a ruined castle that was originally held by the MacDougalls, then the MacDonalds and then by the Macleans who now live at Strachur House in Argyll and are hereditary keepers and captains of Dunconnel. Maclean and his wife managed a hotel at Strachur (where I have stayed often). Maclean was a patron of Strachur and District Shinty Club (In Hugh Dan MacLennan’s book Shinty, Strachur had the bold claim that “It has never folded or merged with another club.” the club played in the grounds of Strachur House, but now plays at a community pitch on the shores of Loch Fyne at Strachurmore. The club was founded by 1880 and there are traditions of annual games on New Year’s Day, with sixty players from Succoth Glen alone. Two of the earliest matches in which Strachur took part were played against Glasgow Cowal. The first took place in April, 1880 and resulted in a draw, four hails each). Fitzroy collected an extensive library, including a full set of early editions of James Bond novels (now doesnee that tell you a great deal), which sold in September 2008 for £26,000. Sir Fitzroy Maclean died on 15 June 1996, aged 85, he was posthumously awarded the Order of Prince Branimir for the humanitarian aid to Croatia, as well as contributing to international affirmation of Croatia. The decoration was presented by the Croatian President Stjepan Mesić in December 2001. Reading his books and researching him, one can understand what kind of a man we was, what a life! Reading of exploits is one thing, but he actually did them, unlike Jamie Bond who is fictional. The SAS of which he was a part, was founded by another Scot in world war 2 as a unique fighting force. Lieutenant Colonel Sir Archibald David Stirling, DSO, OBE was a Scottish officer in the British Army, mountaineer and founder of the Special Air Service. 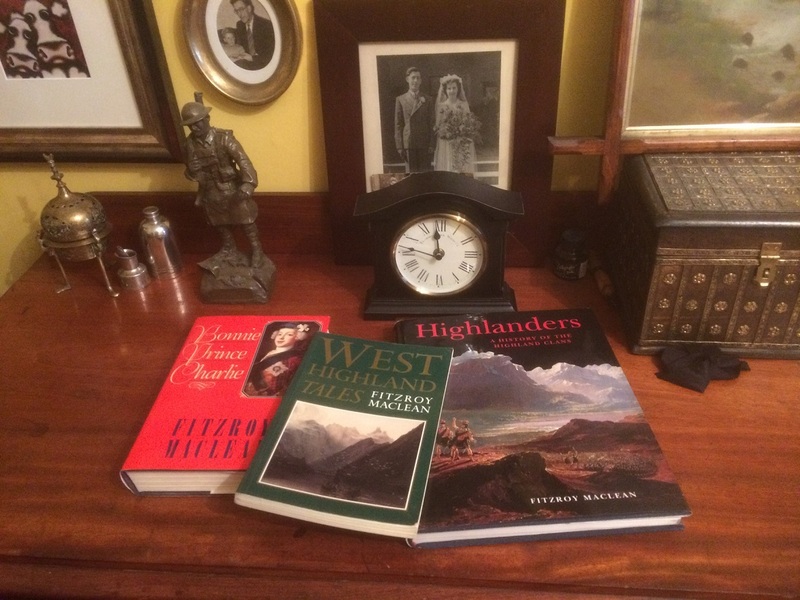 His books litter my shelves, my two favourites being the Bonnie lad’s story and his Highlander tales. What made me look into him and write this wee poem? I am also from that clan, I am a geek for history and, he was a man to contend with that needed me to write about him, to exorcise my head!